There are several reasons why you might want to transfer your National Geographic Genographic Geno version 1.0 and 2.0 results to Family Tree DNA. If you’re not a Family Tree DNA client, there is a whole new genetic genealogy world just waiting on you, and transferring your results is free. 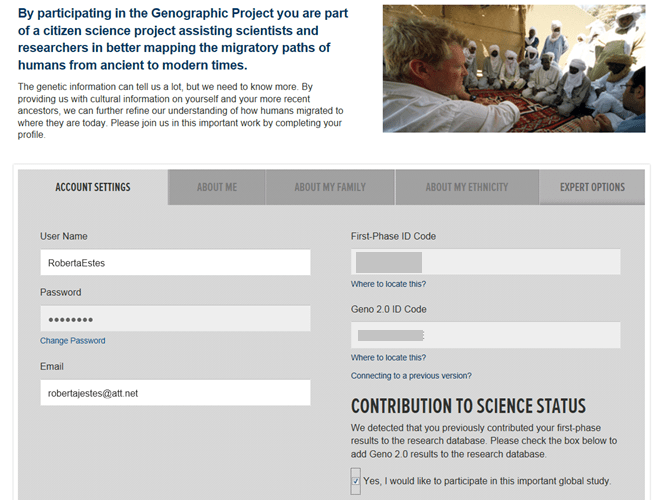 National Geographic test version 1.0, which is no longer available, included a 12 marker Y DNA test, and version 2.0, currently available, includes extensive haplogroup (clan) information that complements the 12-111 marker tests at Family Tree DNA, as well as other information. If you haven’t yet taken the 12 marker or other Y DNA tests at Family Tree DNA, you will be offered that opportunity in order to find your matches. After transferring your results to Family Tree DNA, you will be able to order additional tests, contact your matches via e-mail and share your genealogy information. It’s an exciting time in genetic genealogy! If you are already a Family Tree DNA customer, then you’ll want to download your data for a different reason. The Geno 2.0 chip includes an extensive list of Y DNA SNPs that are tested, far beyond what Family Tree DNA offers, and you will want to integrate this data into your results pages at Family Tree DNA. If you have not yet tested your mitochondrial DNA, Geno 2.0 provides you with your haplogroup, your deep ancestral clan information. The markers required to define your haplogroup will transfer to Family Tree DNA. If you want, you can then order the mtDNA, mtDNAPlus or the full mitochondrial sequence test to see what personal mutations you carry, and who you match. If you have taken any mitochondrial DNA test at Family Tree DNA, none of the Geno 2.0 information will transfer, including updated haplogroup information. The Full Mitochondrial Sequence test at Family Tree DNA is more extensive than the Geno 2.0 haplogroup only test. The two autosomal tests, the one provided by Family Tree DNA (Family Finder) and the one included in the Geno 2.0 product are entirely different beasts. The Family Finder test provides you with a list of cousin matches with numerous matching tools and an ethnicity report. In order to facilitate the transfer, you’ll need to set up an account at National Geographic, and you’ll need your National Geographic kit numbers. So find those before you start. If all else fails, find that lovely black box your Geno 2.0 test kit arrived in. Your participant number is on the inside of the front cover. And you thought it was just another pretty box! You’ll also need your Family Tree DNA kit number and password for the kit you want these results to transfer into. “Check Results.” You’ll be prompted through setting up your account at National Geographic. Whether or not you want to transfer data, you need to set up your account because if you don’t, and you lose your Nat Geo kit number, you’re toast. After you enter your kit ID and set up your account, you’ll see the main results screen. This is mine, and no, my paternal results aren’t missing…there aren’t any because as a female, I don’t carry a Y chromosome! Now click on “Profile” in the upper right hand corner of the screen. You’ll see the profile screen below. You’ll see your profile, along with your kit numbers. You’ll need these for the next step so you’ll want to be sure to write them down. I’ve greyed mine above, but you can see where they were. Note that if you have already transferred your Geno 1.0 results previouisly, adding that kit number here has been reported to generate an error. If so, then try again without the 1.0 kit number. Click on “Transfer Data to Family Tree DNA.” You’re almost done!!! You will be transferred to a screen on the Family Tree DNA site. The kit numbers that you need are the numbers are displayed in your National Geographic account settings screen that I suggested you write down – plus – of course – your Family Tree DNA kit number and password that you want your National Geographic results associated with. Complete this and click on next. You will see an order screen that looks like you are placing an order. Don’t worry, the order is free, but you do need to complete the form. Click through the options and at the end, the free order for your transfer will be complete. It takes about 24 hours before you can see your results on your personal page at Family Tree DNA. 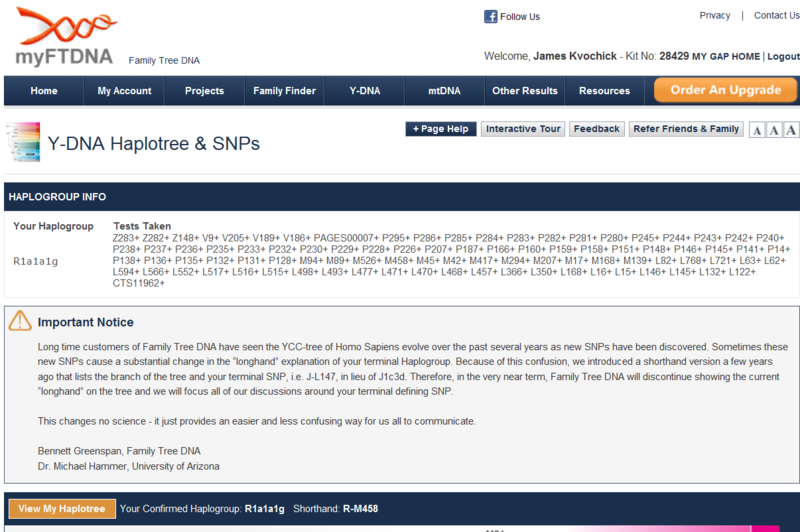 Currently, as of January 12, 2013, you will be able to see your terminal SNP on your Haplotree and SNP tab if your terminal SNP is one that Family Tree DNA tests for in their lab. 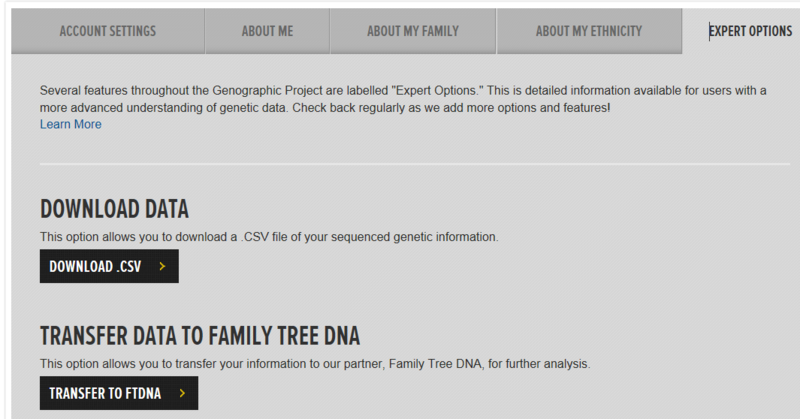 However, if your SNP is new on the Geno 2.0 chip, then you won’t be able to see your terminal SNP on your personal page at Family Tree DNA, yet, so be sure to make note of your terminal SNP from your National Geographic results. Some Geno 2.0 results at Family Tree DNA today show an upstream SNP, and others show no SNP at all. This is one of those good news/bad news situations. The good news is that we are functioning on the leading, sometimes bleeding edge of science and get to play a very important role, which is exciting. The bad news is that we’re bleeding a bit right now. Family Tree DNA really can’t fix this problem until a new haplotree is in place. The problem is that haplogroup/subgroup discoveries are being made so rapidly that the haplotree is in a bit of a state of flux….OK, a big state of flux, which will take some time to sort through. More, many more, discoveries than ever expected continue to be made as more kits are run through the process. Let’s just say we’re having some minor growing pains. But what a great problem to have. We already knew that Geno 2.0 would change the tree dramatically, but we really had no idea HOW dramatically. Now I’m wondering if we’ll even recognize it! What we thought was a tree was only a sprout. And it’s still growing! This entry was posted in Autosomal, Family Tree DNA, Genographic Project, Mitochondrial DNA, SNP (Single Nucleotide Polymorphism) and tagged Basic Education by Roberta Estes. Bookmark the permalink. Thanks for posting this, I transferred my wife’s Geno 2.0 results on the 3rd and no results are showing, I thought maybe I did something incorrectly but your instructions are exactly what I did. Obviously there won’t be anything for her on the Y-DNA page, but should she see results on the Family Finder and mtDNA tabs? Family Finder just has “Learn More” and mt says you haven’t ordered any of these tests. I’ve emailed FTDNA support twice now, hopefully they will respond. Family Finder results don’t transfer at all. If she took any mtdna tests at Family Tree DNA, then her Geno 2.0 results won’t transfer and overwrite those. She hadn’t done any tests at Family Tree DNA, just the Geno 2.0 transfer. I’ve seen numerous reports on several forums that the mtDNA is not showing up when transferred from Geno 2.0 to FTDNA. Actually, I don’t think I’ve seen any reports that mtDNA has transferred properly! And yes, these are new folks, who didn’t have prior accounts at FTDNA and thus no prior testing there. Here’s the response I got from FTDNA, disappointing, but at least it didn’t cost for the transfer. The only information that would have been transferred would be found under the mtDNA>Haplogroup Origins section of your FTDNA profile. Since you do not have any mtDNA matches with our database, you do not have any information at this time. The data-set for mtDNA is not compatible with FTDNA. The mtDNA portion of the Geno 2.0 test is run on a chip, whereas FTDNA must individually sequence strands of your mitochondrial DNA. It is possible this information will be transferable in the future. Thank you for sharing their reply. I transferred my Geno 2.0 results to my FTDNA account (#115485). My yDNA was classified as CTS4466 at Geno 2.0 (4th January) and the FTDNA cannot cope with the new SNP. My WTY results have disappeared also. This is a problem I am having– I had several years ago allowed the results of my mtdnaplus to be transferred to the genographic project. When I went to the genographic project to have my results transferred back to familytreedna I got as far as the screen that asked the kit# and password at familytreedna and I did not remember my password. I contacted familytreedna that I needed my password via email– this was a wk ago and I still haven’t received a reply. I guess I could reset my password if when I put in my kit # at familytreedna if they would direct me to a screen where I could do so. In the meantime I guess I’ll have to send another email! I am going to print these instructions and follow them closely so thank you for this article. I gotta get out there to see this!!! Thanks for the explanation. I had no changes at all to mine at FtDNA. As I am still u152* , that is understandable. But I did think at least that the geographical origins would change, from Palestine to Romania, with British superceding the silly Northern European. So, again, that surprises me. Jokingly though, as I have tested with ALL DNA companies , arguably, over the past decade, I I feel I am owed an honorary subhaplogroup. Rather than the asterisk *, I suggest a dollar sign $. Yes Rich, I like it better than U152? BTW, I tested mtDNA FMS at FTDNA and I was H10b but only got “H” from Geno 2.0. I already got “H” from Geno 1.0 for $99. Enough with the dazzling photographs from around the world used in the marketing campaign. How about focusing on the data? You know, the actual product you’re selling? It’s been 4 weeks since the Genochip results came in and no correction has been made. Very odd. I hope you’ve contacted the helpdesk at Nat Geo about this. There may be an issue with a probe, or perhaps that was an area where your data didn’t read. With over half a million locations, it’s very common to have some segments like that. But only they can address that. Hello Roberta, thanks for another great detailed article. Just a small remark, the new Y-SNPs (CTS, F and PF) do not appear in the SNP tab, but they do appeat in FTDNA in the SNP tab of any project the person joined. You can see the SNPS as an admin, but their terminal SNP is not shown. It’s the terminal SNP identification that I was addressing. Thank you for that additional comment Itai. There are 5 participants in the Munster irish project who have transferred their Geno 2.0 results and I can see that the challenge of coping with the expanded tree is an interesting one. Could they specify the “terminal” also rather than just overwhelm us with the very welcome detail? Great help, Roberta! What if you don’t have an FTDNA account yet but want to transfer the Geno 2.0 (male) into a FTDNA project ? I don’t know Alice. If the person is you, you might try it an see and let us know the outcome. If anyone else knows, please feel free to chime in. I know that most of the 1.0 transfers of course were new people, so I know for sure it could be done previously. I’m just now sure how with 2.0. I don’t know the specifics but several persons new to FTDNA joined my haplogroup project, so it can be done. You can adapt it for any other project, of course. Thanks, Roberta. Will contact someone at FTDNA because I don’t see anything in Ray Banks’ directions under haplogroup g that explains how to do it for those WITHOUT an FTDNA account either (thanks, Itai). And this isn’t for me but someone who is doing the Geno 2.0 and then wants to transfer and upgrade to YDNA67 for one of my projects. If you are female and have already taken the full sequence test, or any of the mito tests, at Family Tree DNA, nothing will transfer. You may still enjoy the Geno 2.0 test for the autosomal portion, but there is nothing to transfer to ftdna. Their autosomal tests are quite different and the FTDNA mito is more extensive. I do understand that GedMatch is working on integrating the Geno2.0 file into thier offering, but it’s not soup yet. When it is, you could download there and potentially find cousins. If you have already taken the ftdna Family Finder test, not sure what this would buy you. Thank you so much for the advice, yes I have the FMS and Family Finder tests at FTDNA, but will bear in mind that GedMatch may be a possibility. Even if no mtDNA tests have been taken at FTDNA, it is not apparent how Geno 2.0 mtDNA results will transfer — particularly if they are in the same deficient format available now for Geno’s downloading option. After downloading my DNA data, I discovered the current format strips out the strand/forward-reverse reading information, so it is not possible to verify that a base is C vs. G or A vs. T relative to the rCRS. Thus C/G and A/T polymorphisms cannot be identified. On the Yahoo DNA-NEWBIE group, I learned that the download format previously available did include meaningful probe information, but also had problems. I don’t know if the current format is also deficient for Y-DNA. More than a week ago, I emailed Geno customer service, but have yet to receive a reply. Anyway, trying to transfer ambiguous data to FTDNA now does not appear sensible, and I intend to defer until Geno 2.0 provides a meaningful data format. There are a number of things going on with autosomal DNA results and unfortunately, they are all tied together. Recently on the personal pages, Family Tree DNA has been providing updates as to the Built 36/37 ongoing saga. It’s been much more difficult than they anticipated. In addition. the results from Geno 2.0 need attention, and the results don’t display correctly because they don’t have a “tree” on the Family Tree DNA side to plus into. That is still not resolved. Unfortunately, part of that problem is that there is an unpublished paper and some of the SNPS can’t be made public before the paper is published, so there is a bit of a catch 22 going on, not to mention that there is only one IT departments and they have to prioritize. So, the short answer to your question is no, things are not quite right yet but they are improving and I hope they will be finished with the improvement shortly. Golly this is a tad confusing. I live in South Africa where I have just recently done my mtDNA through the National Health Laboratory Services and I received my results back, I have come up with 67 identical matches on the local database but the Laboratory made it clear that they are prohibited from sharing details of matches. As much as I appreciate that I truly need to know my matches. The laboratory here does not do autosomal DNA testing and I very eager to join the National Geographic Project. I was wondering if there are still problems with transferring results from Geno 2.0 to FTDNA? I did not have an acct with FTDNA but transferred my Geno 2.0 results about a week ago. I see nothing at all on the FTDNA site. It states that the transfer was done under the order page but I see no results. Also when I tried to email them with a query it stated that the kit # was invalid. Whats the point of transferring results if I cant see anything? I am a female so it is the MtDNA haplogroup connections I was looking for. Do I have to order a test to get results? I have already tested with Ancestry.com and 23and me and don’t really want to spend money on more testing. If you have previously tested your mitochondrial DNA at Family Tree DNA, they do not overwrite your information with that from Nat Geo. So in essence, if you already took that test at FTDNA, there is nothing for a female to transfer from Nat Geo. That may be why you’re not seeing any results. I have not tested with FTDNA before and did not have an account. I just transferred my results from Geno 2.0 be use it was an option. I thought that I would be able to see results and any matches but there is nothing. It looks like nothing was transferred but on the order page it show the transfer. Ok, here is the problem. The Nat Geo test only provides your haplogroup designation. It does not test your private mutations. Those private mutations are the mutations that allow matching to others. The mutations that show your haplogroup are shared among many thousands of people – it’s your private mutations that are meaningful in a more recent timeframe. You should be able to go to your results page and see at least a haplogroup designation. Look on your Haplogroup origins tab and see if something shows. They do say it takes 24 hours, so bear that in mind and it is a weekend too – so that may be 24 hours during the business week. It does not show anything, not even my MtDNA haplogroup. I transferred the results last week and the page is blank still. I wonder if I delete my acct and try again, if that would work. My wife was a Geno 1 participant and transferred results to FTDNA and has had no further testing there but has now results form her Geno 2 test. From your comment above I take it that there is nothing to be gained by her transferring the Geno 2 test into her current FTDNA account? If that is so maybe she should/could transfer her Geno 2 test into a NEW seperate account at FTDNA? or is there no gain at all either way? I believe she could set up a new account, but I don’t think there would be much to gain. Once separate, they can never be combined. We’ve already seen that issue. The only thing she gets at Nat Geo that she does not get at FTDNA on her mitochondrial is the full haplogroup. If she takes the full sequence at FTDNA, it is more reliable than the Nat Geo haplogroup which reads probes and there are occasionally segments that do not read properly. Well we feel a bit ‘ripped’ off so to speak.for $100 Geno 1 showed her as T2, for $199 Geno 2 shows her T2b and some ‘percentages re affiliations with world regions’. It appears that she would have got far better value spending another $70 at FTDNA for the mtHVR1tomega test or another $90 for the Family finder test.. If/when there is a Geno 3 test I think we will be vary cautious about participating. Actually, looking at my page it has a blue box with H1a, mtDNA haplogroup written in the box, but when I clik on it it says “Once your results come in, this page will contain your exact mtDNA results.” Also, on my home page below the blue box, it has a dotted line and then underneath it says mtDNA with a question mark. So is that all I get from this? This is confusing to me. Well, something happened because your haplogroup badge, the blue box, is showing. It’s hard for those of us who have tested previously to know what a “correct” trasnfer account looks like. I think you need to call the phone number on Monday and see if this is working correctly. The HVR1 and HVR2 are your personal mutations, so that part makes sense. Sorry for all the replys, I went to the haplogroup origins tab and there is nothing there, not even a haplogroup designation. Under HVR1 matches it says to purchase an upgrade and under HVR2 it is the same. There is not even a designation at the top where it says mtDNA haplogroup origins. What should or can I do??? should I try to transfer my Geno 2 into my mtDNA account? Or should I transfer into a new account at FTDNA???? test results in the one account, but this appears not possible. bear in mind I’ve just ordered Family Finder test in my YDNA account. Call Family Tree DNA and talk to a customer service rep. Thanks for the reply, but international calls are too expensive, I did email but it’s usually a week before they reply. Got a reply from another source, thought I’d post it here as it may help others… Regards Graham……. This message displays when you check the Geno1.0 box on the transfer page, enter your GPID from your Geno1.0 test, and try to transfer to an account that already has Y-DNA results. Since you already transferred your Geno1.0 Y-DNA, don’t check that box. Just check the Geno2.0 box and enter your ID for that test. Question… I have transferred my Geno 2.0 results to FTDNA but how do I get the genetic sequence that I can plug into ySearch to look for matches. That is not part of the Geno 2.0 test. That sequence is your STR markers and those you get by males taking the 12, 25, 37, 67 or 111 marker test at Family Tree DNA. What that Geno 2.0 test tested for males was SNP markers for haplogroup only. Those are two different kinds of information. If you are a woman, then you need to find a male with the surname you are interested in to test – like a father, brother, uncle, etc. Which grandmother? His father’s mother or his mother’s mother? Well crumb. If it was his mother’s mother, then he would carry her mitochondiral DNA, but since he does not, we have to look elsewhere. You need to find someone descended from his father’s mother through all females. You need to test her mitochondrial DNA and the only way to do it is to find a descendant or someone who shares that same maternal lineage. Woman pass their mtdna to all of thier children, but only females pass it on. So any of her children carry it, but only her daughters pass it on to their children. If you can find one of these people to test, the mitdna test will tell you if the direct female line is Native or not. Oh wow. Thanks for the info. I’m 30, My dad’s 60 and has 4 sisters 70 years old down to 50 and they are all generally suspicious of everything new and technologically advanced 🙂 I’ll have to do some fast talking…. wish me luck. Yikes… I’ll have to do some research… we’re going into a gray area. If my thinking is correct I can use one of my dad’s aunt’s female children, unfortunately we’re all out of aunts. Thanks for your help. This process can get a little confusing. Glad to help. Thank you. You must take an upgrade test on FTDNA. Of course you must payed again to your upgrade test. I suggest you to take a Y37 and mtFullSequence DNA Test from FTDNA web. These are a moderate resolution DNA test if you just want to know your ethnicity. 1 for all. I not suggest you to take a BigY and Y111 DNA test because these test are too expensive especially a BigY test, it cost around $ 576 / single test. Do you transfer your Geno 2,0 DNA test results to FTDNA? If so, you can take an upgrade test with your material DNA in your Geno 2,0 tube. The Genographic Project don’t discard your material DNA. While I am awaiting me Geno 2.0 results. Is there an FTDNA kit, I should buy to best compliment my GENO 2.0 results? Will I need a FTDNA kit to transfer? I also have a pretty extensive Gedcom file I could add. I believe that when you transfer your results from Geno 2.0 to Family Tree DNA, you are then offered discounts on the full mitochondrial DNA sequencing and the STR markers for the Yline testing as well. Those are the tests you should take at Family Tree DNA to compliment your Geno test. If you want to have cousin matches, then you may want to take the autosomal test as well. It’s called Family Finder. Geno 2.0 autosomal results are not transferred to FTDNA. I just tested my 96 year old father and my 90 year old mother with the Geno 2.0 kit. From what I have read, I may need additional tests from FamilyTreeDNA when I transfer. Since they are very old and I want to get all the DNA information I can, what tests do you recommend? At this time I am very confused. You will want to order the yline and mtdna full sequence for your father so that you can get his personal mutations and not just his haplogroup information. For your mother, you will want the full sequence mtdna, for the same reason. You may want to order the Family Finder for them as well so that you get percentages of ethnicity and cousin matches. This will help you if you take the family finder to know which side your matches are from. I recently transferred my Geno 2.0 results to FTDNA (I had never done any mtDNA testing with FTDNA at that point). After the transfer was completed, my mtDNA haplogroup appeared as [T2b4] in my FTDNA account. Since that time, I have completed the mtDNAPlus test with FTDNA (HVR1 and HVR2 regions only — NOT the mtFullSequence test). After the mtDNAPlus results were returned, the mtDNA haplogroup reported in my FTDNA account was changed from [T2b4] to just [T2]. If you do the upgrade, you also get your coding region mutations and who you match at that level. There are times that the full sequence haplogroup is more specific yet than the Nat Geo one, but most of the time they are the same. Agreed, there are no subclades below the T2b4 level that I am aware of, so I wouldn’t expect the full sequence haplogroup to be any different from the Geno 2.0 results. I went ahead and ordered the full sequence upgrade today. I’m still not expecting to see a lot of close genealogical matches to my mtDNA compared to my Y-DNA and Family Finder tests, but it will be interesting to see in any case. Thank you! Geno and FTDNA could not tell what I get for transferring from geno 2.0 to ftdna. This is the most relative (no pun) info I could find. From what I’ve read I still need to purchase additional kit to get a better breakdown of my recent ancestry and where they originated. I transferred my Geno 2.0 yesterday by following the “Transfer to FTDNA” link on the “Your Story” page of the Geno website. I didn’t have a previous FTDNA account so was a little confused when it looked like I would need to buy something. But I just entered my home address and e-mail address (optional) and it showed $0.00 for purchasing the transfer (no credit card info needed). After that it showed a FTDNA kit number and password (which was also e-mailed to me). I haven’t tried to log in to FTDNA yet so no idea what data is transferred, but since I had no FTDNA data to overwrite I didn’t see any reason not to do the transfer. Might be different for those with existing FTDNA accounts. 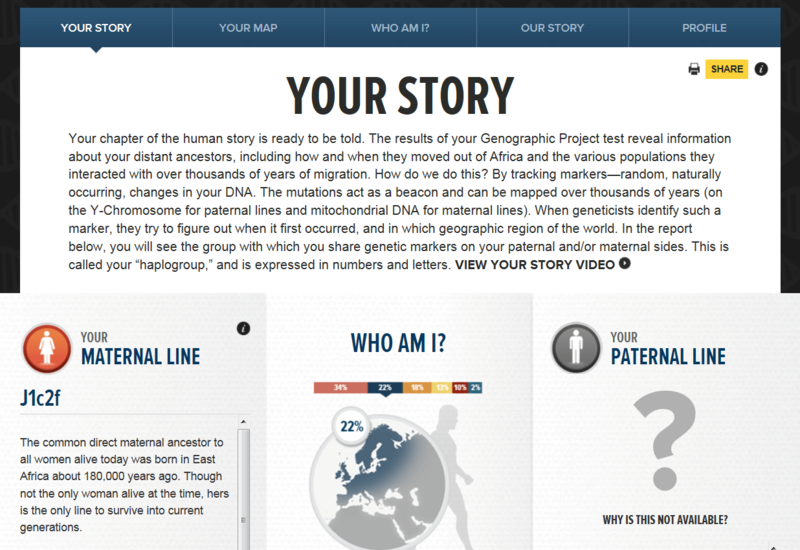 Go to http://www.genographic.com to order a test from National Geographic or to http://www.familytreedna.com to order a test from them. I transferred my DAd’s NG 2.0 results to FTDNA on 2/18/2014, although I see nothing to indicate they were received. Is there supposed to be a box like “Y-DNA Results Completed”? Also, Dad’s NG and FTDNA place him in two different haplogroups. Ancestry said he was R1b, FTDNA shows results for someone else (presumably) from the 48-111 level, and he is Hg I, and Nat Geo says he is I-L22+. So confusing. Help! Thanks for the wonderful exposition, I did the Geno 2.0 test & transferred my results to FTDNA which I have no prior account with. My Haplogroup with Geno 2.0 was (J-YSC0000080), & it showed up in FTDNA as (J-L222) , are those the same ?? anyway, I added myself to a few projects of similar haplogrouping but my results didn’t show up ! !, shall I order a YDNA test to be able to benefit from their matching capabilities ?? will they use the information transferred or will I have to submit another DNA sample ? No, those aren’t the same. You might recheck your account since FTDNA implemented the new tree a few weeks ago, if you haven’t done so. Projects are geared towards STR markers, so your results would not show up there without any markers. I do believe you’ll need to submit a new sample and yes, 67+mito fms would be a good place to start. Thank you for the info, In genographic site my map shows those consecutive markers (M42, M168, M89, M304, M267, P58) Those markers shows in GREEN in FTDNA tree section with a note saying (Your Confirmed Haplogroup is J-L222), so how aren’t they the same ?? who is wrong then ? How can I recheck my account ? shall I try to transfer the data again ? I doubt that it’s a matter of one or other being wrong. I suspect that it’s a matter of the SNP at Nat Geo not being on the FTDNA tree. Do a browser find on the tree page and see if the Nat Geo SNP is there at all. If not, then J-L22 is probably the closest on the tree. You can contact customer support and ask the question as well. My father transferred his Geno 2.0 results to FamilyTreeDNA. If we pay for the FamilyTreeDNA Autosomal test than will he have to provide a sample to FamilyTreeDNA or will they be able to use whatever was downloaded from Geno 2.0 to give us the results? It’s a different test, so you need to submit a new sample to FTDNA. They don’t use the Nat Geo samples. I have several questions that I have not seen answers to in the threads above, though I could have missed something. I am relatively new to the whole DNA testing side of genealogy and biology/biomedicine was not my forte. Please forgive me if any of this sounds ignorant or redundant. 1. I did the Genographic Project test in early 2012, so I presume that my kit was Geno 1.0, but how do I tell for sure? 2. If I decide to transfer my results to Family Tree DNA, do I get free, unlimited, indefinite access to their data base of matches, or will there be additional charges? The only other option that I see for registering is to take one of their tests. 3. If I decide to transfer my results to Family Tree DNA what exactly do I get out of this? In particular, will I be able to see matches with bloodlines in Ireland, Scotland, Sweden, etc? My ancester’s trail grows cold once I get to Ireland. I believe my ancestors were from Scotland and only in Ireland briefly before immigrating to the USA. Will transferring my test to Family Tree DNA help me with these kinds of issues? Thanks for your help. In version 1.0 you would have received 12 marker STR information. Yes, if you transfer that information the transfer is free and so is access to their data base for those results forever, just like you tested with FTDNA. In version 2.0, you received a lot of SNP information that also transfers for free. In the new version 2.0NG that was introduced in the fall of 2015, that test tests autosomal DNA in addition to the Y and mito. The transfer itself is free, but there is an additional $39 to be able to utilize the autosomal portion of the matching data base, just like there is with any other autosomal transfer. The Y portion is still unlimited and free. You can always call customer support at FTDNA for further clarification.